A new report shows that the global markets for residential energy efficiency technologies reached nearly $89.4 billion in 2016, and should reach $124.2 billion in 2022. They results from Reportlinker shows that with the expected results for 2017 reach $96.8 billions it demonstrates a compound annual growth rate (CAGR) of 5.1% from 2017 to 2022. The scope of the report includes new construction and retrofits for major residential energy efficiency technology categories that are popular or gaining market share in regional or national level markets. Residential energy efficiency technologies help to reduce energy consumption within single family residences, as well as multiple family dwelling units including apartments, condominiums, and townhouses. Specific technology categories considered in this report comprise the individual technologies identified in the following table. Within this framework, market breakdowns are provided for the following categories as relevant to new residential building construction and retrofits, shown in the table. Estimated values used are based on manufacturers' total revenues. Projected and forecasted revenue values are in constant U.S. dollars, unadjusted for inflation. 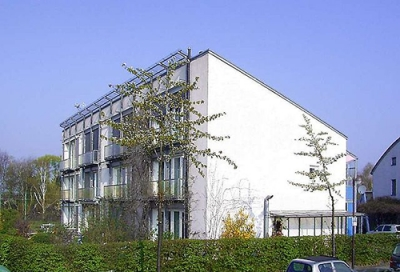 Picture of a building based on the passive house concept in Darmstadt, Germany by Passivhaus Institut - Copied to Commons from http://en.wikipedia.org. Original source Passivhaus Institut, Germany, CC BY-SA 3.0.